Christmas, a time for partying, shopping and some festive slots play. If you’re looking for a game to get you in the mood for the holiday season then here’s our pick of the best yule-themed releases. Take a trip to Santa’s workshop in Jingle Spin, a 5 reel, 20 payline slot from Net Entertainment. Featuring the Scandi developer’s usual high-end design, this festive offering comes with unusual gameplay which can really ramp up the tension. Above the reels is a Prize Wheel carousel. Land a bauble on the main reels and it’s passed to an elf who places it on the carousel. The bauble then moves 1 reel along the carousel with each spin until it drops off reel 1. Land a wild directly underneath a bauble and it becomes active and awards spreading wilds, an instant win of up to 125 times your stake or up to 50 free spins. Once in the Free Spins feature, you can win more free spins, get cash prizes, spreading wilds and surprise baubles (which award any of the other 3). With cracking sound and visuals and an exciting gameplay, this innovative take on the classic Christmas slot is a real entertainer. You’ll find more classy design in The Nutcracker, a 5 reel, 20 payline slot from iSoftBet. Based on the fairy story that was turned into a ballet, it comes with 2 different free spin rounds. In the Fairy Free Spins feature, you’ll play with up to 60 free spins. Every time the stacked Nutcracker wild fills reel 3, it increases a multiplier by 1, up to a maximum of 10x. Trigger the Nutcracker Gift Bonus & Free Spins feature and you’ll receive between 5 and 10 free spins. The Nutcracker wild will fill reel 3 for the whole of this feature. Winning symbols are held here and streak respins come into play. If you’re after something traditional this Christmas, then this is the one to choose as you can win up to 5,000 times your stake on every fairy free spin! Something far more light-hearted is on offer is Selfie Elfie – a 5 reel, 40 payline slot from Playtech. Wilds are central to the action in this slot. The Selfie Elfie Respins feature can land at random on any base game spin. Elfie will take a selfie with 1 of the higher value character symbols which becomes a second wild during the respin that follows. It’s a similar story in the Selfie Elfie Free Games feature where 8 free spins are on offer. The carousel above the reels is in play during each free spin. Each new symbol that gets snapped with Elfie the Elf becomes wild for the rest of the round. Landing a +3 awards 3 free spins to your total. Simple but entertaining, Selfie Elfie can deliver some pretty wild action. Leprechaun Carol is a 5 reel, 20 payline slot from Pragmatic Play takes the classic Irish fortune-themed slot and gives it a festive makeover. It comes with plenty of Christmas goodies too. They include pick and win instant prizes, colossal 3×3 symbols or raining wilds which can all arrive at random. The game also comes with 3 features. The Free Spins Picker feature awards 20 free spins with a 2x multiplier. Pick from the magical mushrooms to add extra free spins and boost the multiplier award. In the Coin Collector feature, you’ll get 15 free spins with all payouts doubled. Collecting coins can increase that multiplier up to 6x. Last but not least there’s the Giant Symbols feature. The prize here is just 3 free spins but a colossal symbol is in play on all of them. It starts on reels 3, 4 and 5 on free spin 1, moves to reels 2, 3 and 4 on free spin 2 before finally shifting to reels 1, 2 and 3 on your final free spin. There’s up to 6,000 times your stake to be won on ever spin too! The last of our festive favourites is Fat Santa – a 5 reel, 25 payline slot from Push Gaming. Featuring colourful design, it comes with a pair of cracking extras. On any spin, Santa’s Sleigh can fly across the screen and drop Christmas pies onto the reels. These are wild and in play on the spin that follows. Fat Santa also comes with a Free Games feature. Keep a special eye out here for the mince pie symbol. Santa eats these whenever they hit to add to the Pie Meter. Fill the meter to add more free spins to your total. You can win 6,405 times your stake on each spin. 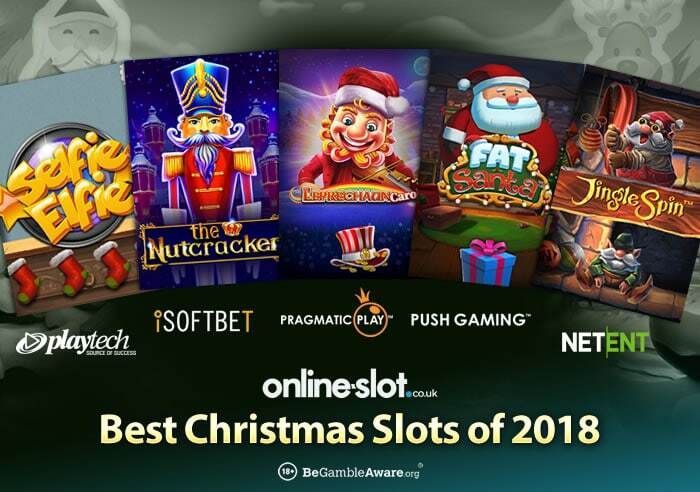 If you’re feeling festive, there are plenty of older Christmas themed slots to play – you have the Christmas editions of NetEnt’s Fruit Shop and Flowers, Secrets of Christmas (by NetEnt), Taco Brothers Saving Christmas by ELK Studios, Ghosts of Christmas by Playtech and Christmas Eve by Playson. Visit our Online Slots section to find them all.